At Red Fly, I rigged dozens of characters with full-body IK/FK rigs. But it was my face controls rig that I’m most proud of. I made it to be completely portable to different sized, differently proportioned human faces. I made this face rig, based on Jason Osipa’s rig, but it also has an additional layer of controls; the control panel can get the animator most or all of the way there, but in addition, the animators can also move (and rotate and scale) the set of controls directly on the face for a second layer of control. The eyelids are also driven by the eyes so that they move properly when the eyes look around. I originally made it for the Ghostbusters game – it is used on all of the characters’ faces in GB. It is also portable and scalable; it will work on any size human character’s face. Red Fly has now used it on four projects, on over a dozen characters, including the main character for Star Wars: The Force Unleashed II (Wii), and Thor: God of Thunder (Wii). I also wrote a handy face controls MEL script GUI that allows the animator to automatically set phonemes, reset the control panel, reset the controls on the face, and so on. At Red Fly, I noticed within the first week or so that animators were spending a great deal of time exporting animations one at a time, so I wrote a MEL sciprt for batch-exporting animations and cinematics with a simple GUI. That way, if a character’s skeleton rig changed, all the animations could be exported quickly. At Merge Interactive, I created quite a few MEL scripts (you can see that I used very similar GUIs) as well as Photoshop actions for automating tedious work. One of them is a Batch Selected FBX Exporter. 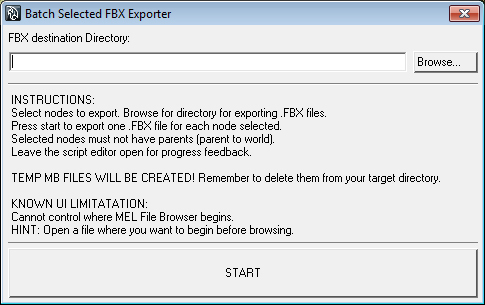 The user can select a bunch of nodes in Maya, then each of those nodes will be exported as individual FBX files. 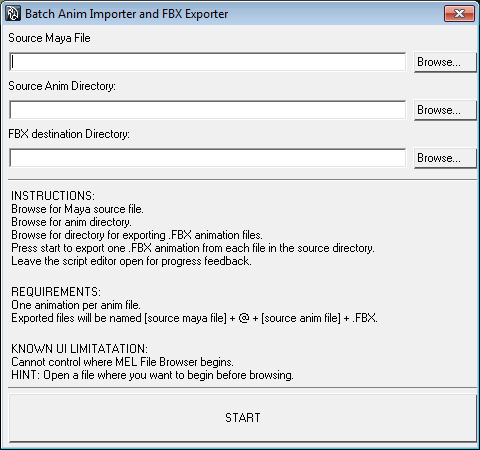 Another batch tool converts .ANIM files to .FBX files, by importing the .anim files onto a source character (maya file), then exporting the FBX file. At Spacetime Studios, I helped to design the features and functionality of a bunch of the tools, and created wireframe mockups for many of those.